Since 2011, the wars in the Middle East and North Africa have been characterized by the extensive damage to what we call “environmental infrastructures”—water, sanitation, and energy facilities—many of which sustain both basic human needs and safeguard ecosystem services. In our Security Dialogue article, “Targeting Environmental Infrastructures, International Law, and Civilians in the New Middle Eastern Wars,” we find that environmental infrastructure is increasingly targeted, which has long-term adverse implications for state capacity, human security, and conflict resolution. The destruction of environmental infrastructures is now an increasingly prevalent form of war-making in the region, rather than simply an unintended consequence. While scholars such as Alexander Downes have shown the pervasiveness of direct targeting of civilians, the indirect targeting of civilians’ basic needs has been mostly overlooked and uncounted. In the new wars in the Middle East, as Mary Kaldor and others have found, the multiplicity of war-making forces involved in these conflicts has changed the nature of war itself. Militias and state security forces seek to control or destroy urban environmental infrastructures in order to displace urban populations, punish civilians perceived as sympathetic to the enemy, control revenues from oil and gas, or gain control over the essential services that underpin urban life. Water pumping stations serving Aleppo been repeatedly bombed by different parties to the conflict: In September 2016, the United Nations reported that nearly two million people were without running water. ISIS has also sought to control water and infrastructure across Iraq and Syria, including Syria’s Tabqa Dam, which it controlled from 2013-2017, limiting water and hydropower to Aleppo and neighboring cities. Air campaigns by the United States, Russia, and other regional powers, alongside an array of foreign proxy forces, further complicate efforts to rebuild and maintain infrastructure. The sustained urban sieges in Syria and Yemen, as well as the Saudi-led air and naval blockade of Yemen (which is actively aided by the United States and the United Kingdom), have cut off access to energy, food, water, and sanitation. Through these repeated disruptions, the deprivation of civilian populations becomes normal—with deadly consequences for the most vulnerable people, including children and the elderly. For example, without adequate water and sanitation infrastructure, Yemen suffered a rapidly escalating cholera outbreak that threatens to become the largest ever recorded. Warring parties sometimes try to justify these attacks using the language of international law by suggesting that targeting infrastructure is acceptable when it is “dual-use” (civilian and military) or when its destruction is a form of “collateral damage.” But many electrical and telecommunication systems are used by both militaries and civilians, putting civilians increasingly at risk. While provisions in international humanitarian and environmental law prohibit attacks that damage the natural environment or civilian infrastructure essential for human survival, these have acted neither as a deterrent nor served as an effective means of prosecution. Only in few instances has the United Nations Security Council acted on these grounds, primarily when the Iraq military set the Kuwaiti oil fields alight as it retreated during the 1990-1991 Gulf War. Our research project will continue to track and analyze the destruction of environmental infrastructures over time and across the Middle East and North Africa, including in Iraq, Lebanon, the West Bank, and Gaza Strip. Intermittent periods of rebuilding and reconstruction of basic infrastructures in many of these countries has thus not averted long-term “de-development”: the economy cannot grow due to lack of critical inputs; vulnerable populations suffer long-term health impacts; and ecosystems endure long-term damage. How should international and local humanitarian actors adapt to meet this challenge? The international community needs to privilege human security during war by holding states and militias accountable to the general principles of international humanitarian law that limit the indiscriminate and indirect targeting of civilians. Because many of these conflicts do not have a clear end in sight, humanitarian and development actors also need to rethink how to build resilient infrastructure in conflict-affected regions. In particular, decentralized energy and water systems may offer more viable solutions for reducing vulnerability in conflict settings and facilitate a more lasting reconstruction than centralized, state-controlled infrastructures. Jeannie L. Sowers is an associate professor of political science and chair of the International Affairs Program at the University of New Hampshire. Her research focuses on the intersection of political economy and ecology in the Middle East and North Africa. Erika Weinthal is the Lee Hill Snowdon Professor of Environmental Policy at the Nicholas School of the Environment, Duke University. She specializes in global environmental politics and environmental security with a particular emphasis on water and energy. Neda Zawahri is associate professor of political science and director of the graduate program at Cleveland State University. Her research focuses on environmental security and environmental politics in the Middle East and South Asia. 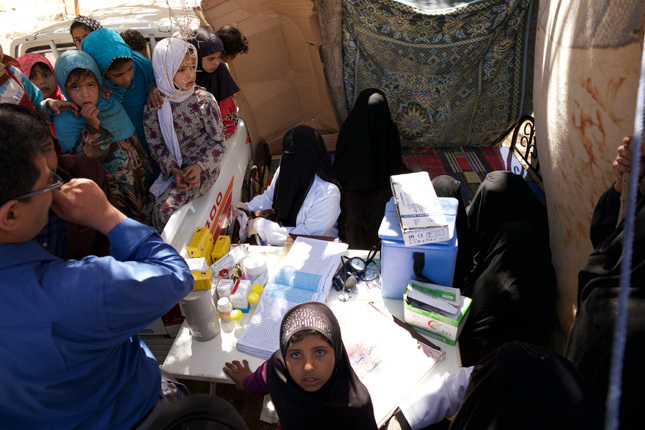 Photo Credit: Mobile health clinic in Yemen, March 2016, courtesy of Flickr user Julien Harneis.